Concerned at the alarming rise of e-waste burden in the city, Bhubaneswar Municipal Corporation, in association with its implementation partners SDRC and Sofies Sustainability Leaders Pvt Ltd, will install e-waste sculptures soon across the city in order to create a massive awareness among citizens. It can be mentioned here that rock gardens, made out of various wastes, have already become major tourist attractions at many cities across the country. As per the Waste Management Rules, 2016, the e-wastes should be scientifically stored and dismantled as their unscientific management leads to pollution and various environmental hazards. The two sculptures will be placed at two major locations. These installations would be part of Clean E-Bhubaneswar Project under IFC-EU Eco-Cities Programme. Clean E-Bhubaneswar project is a joint initiative of International Finance Corporation-European Union Eco Cities Programe and Bhubaneswar Municipal corporation. 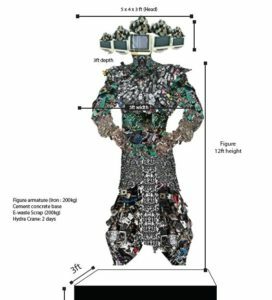 As a part of the project the two e-waste sculptures are being planned to be installed in the Temple City. While one sculpture is with a theme Hand pointing to the ground, it gives the message that we need to reconnect with Mother Earth by being responsible in scientific management of Electronic Waste (E-waste) and recycling it in a sustainable manner. The second sculpture is named as “Raavan.’’ This sculpture gives the message that we would need to be responsible in management of E-Waste by following the principles of reduction, reuse, repair and recycle. Naming of the sculpture as per the mythological character explains that if we ignore the issue, one day E-waste could also becomes a demon like Raavan and do harm to the human race. The “Hand pointing to the ground’’ sculpture, made by well-known city-based artist Veejayant Dash is ready and was earlier unveiled by Development Commissioner R. Balakrishnan in a city based event. It will be installed at Power House Square.The second sculpture titled “Raavan”, for which the drawings are already finalised, will be placed at Jaydev Vihar Square.